Druids of the Dryads have spent their lives to understand neture, and control it if needs be. They are the driving force of the Dryads, able to make plants grow at a simple touch and massive trees form from tiny across. It was said that when the Twil Forest was seeded, it took but one night for every tree to grow into maturity. 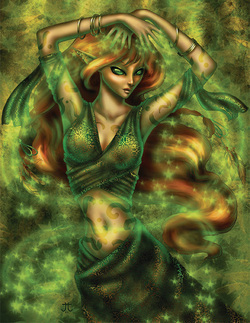 This is widely disputed, mostly by the Elves, who believe that they would have had to have several thousand Druids for such a spell. The truth lies with the Dryad Druids; noone knows how many there are or where they reside, they just are there if anyone dares to destroy their forest that they call their home.